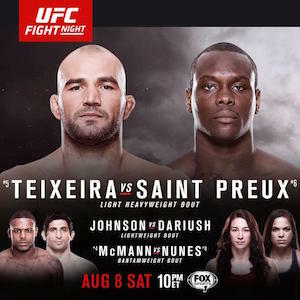 UFC Fight Night 73 took place this past Saturday night at the Bridgestone Arena in Nashville, Tennessee and was headlined by Glover Teixeira snapping a two fight losing streak with a submission victory over Ovince Saint Preux. According to Nielson sources, the main card broadcast on FOX Sports 1 had an average live audience of 1,159,000 viewers and 684,000 of those viewers were in the A18-49 category, making it the sixth most-watched UFC Fight Night in FOX Sports 1 history in both categories. The show peaked at 1,356,000 viewers during the 12:45-1:00 a.m. ET quarter hour and following the fight card, FOX Sports Live tallied increases of +51 percent on viewership (392,000 vs. 260,000) and +38 percent on A18-49 (239,000 vs. 173,000) compared to its August 2014 average in the Saturday 1:00 – 2:00 a.m. ET window. 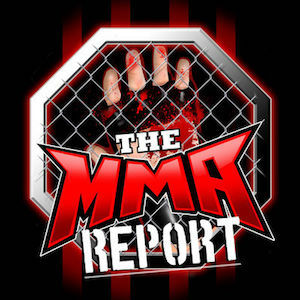 Prior to the main card broadcast, the televised preliminary card aired on FOX Sports 2 and averaged 306,000 viewers. This is the most-watched UFC prelims on FOX Sports 2 and the fourth most-watched telecast since the launch of FOX Sports 2. The UFC will return to FOX Sports 1 on August 23 for UFC Fight Night 74: Oliveira vs. Holloway. The coverage on FOX Sports 1 will begin at 6:30 p.m. ET/3:30 p.m. PT on Sunday with the pre-fight show and the live fights on the cable sports network will begin at 7 p.m. ET/4 p.m. PT.